Your waterfront is important and a Lake Aerator will help improve water quality, provide an aesthetic and circulate the water to prevent stagnation. You could have the most beautifully kept property, but if your lake front is foul smelling, algae covered or swarming with annoying bugs you are not enjoying a pleasant experience. In order to create an appealing sensory experience at your dock while avoiding the use of expensive chemicals consider installing an Arbrux floating lake aerator. When you have stagnant water you are creating the ideal breeding ground for bugs like mosquitoes to thrive and irritate your guests. Aerators circulate the water bringing fresh oxygen throughout, depriving mosquitos and other pests a place to nest and reproduce. Stagnant water can create foul odors and algae and prevent decomposition of other organic matter on the lake bed. By installing a floating lake aerator you can reduce the growth of algae and circulate oxygenated water. Lakes without proper aeration will not break-down nutrients quickly and this means more nutrients will be available to turn in to muck on the bottom and to fuel algae blooms. Lake aeration adds oxygen to the water, reducing algae, discouraging water breeding insects such as mosquitoes, and eliminating odor problems associated with stagnant water. Aeration provides a healthy home for desired aquaculture by preventing stratification. A properly cared for and aerated lake is noticed. The water is clear, and issues with odor or insects are reduced or non-existent. Lake aeration reduces the likelihood of potentially dangerous algae blooms from forming in your water. Aerators are a better environmental choice than chemicals, but they are also much cheaper and lower maintenance. Arbrux floating aerators are virtually maintenance-free and require very low costs to run.They are available in ½,1,2, & 3HP motors and move 500-2,700 gallons of water per minute depending on the model you choose. They are commercial quality, durable, come with a 3 year warranty, and are electrically safety tested and listed with ETL to CSA and UL Standards. Arbrux floating aerators come in a variety of different spray patterns and power combinations to suit your project needs. Give your guests an upscale experience and keep your waterfront healthy, safe, and pleasant at the same time. Buying a lake aerator from Arbrux means you are buying direct from the manufacturer. 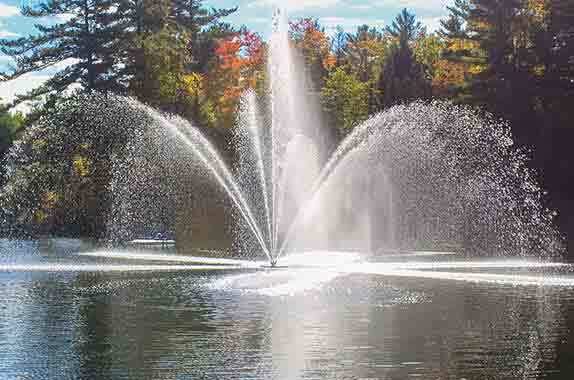 We only produce high quality low maintenance aerators and floating fountains. You can be confident you are getting a superior product with excellent performance at a competitive price. To receive a quote please complete contact us form or call us toll free at 1-888-211-3548.